Brussel sprouts. It seems that most people either love them or hate them. I fall into the “love them” category and, thankfully, my kids do too! There are many ways to prepare them, but my absolute favorite way to have them is roasting. Roasting brussel sprouts is the perfect way to bring out the most delicious flavor. It’s particularly good if you haven’t tried them before or you have and didn’t like them but are willing to give it one more shot. I just love roasted brussel sprouts and can’t get enough of them! To switch up this recipe, I added some sweet potatoes and a few really delicious seasonings. I topped it off with a little red wine vinegar and let me tell you – the combination is spectacular! The brussel sprouts have an earthy flavor that can be a little bit bitter. Roasting helps to really tone down that bitter flavor and leaves you with the delicious earthy flavor. It pairs so well with the tender sweet potatoes and the combination is a mouth wateringly good dish. Not only does my family love these Roasted Brussel Sprouts and Sweet Potatoes, but it’s a great hand-off side dish. Whenever I have something that I’m making that’s a little more labor intensive or needs more attention during cooking, I like to have easy, hands-off side dishes. This is perfect for that. Once the veggies are prepped, just roast them until they’re done. If you really want to be involved, stir them once during cooking. Earthy brussel sprouts and tender sweet potatoes are perfect when they’re roasted until lightly browned. But they need a little more flavor to really make them delicious. I added just a little olive oil to keep them from burning. Next up was some minced garlic and to top it off, a little ground cumin. The garlic adds a very subtle, almost spicy flavor and the cumin really pulls together the starchy sweet potato and robust flavor of the brussel sprouts. Red wine vinegar gets sprinkled over the top at the end. I really liked the bright flavor the vinegar added. It just added a bright and mouthwatering quality to the whole dish. When vinegar gets cooks a lot of the acidic flavor gets cooked off. By adding it at the end, I was able to keep the acidic vinegar flavor and it really pulled the flavors of the whole dish together well. You’ve heard of them, probably tried them and may love them or hate them, but what ARE brussel sprouts? Brussel sprouts are a type of cabbage that has edible buds about an inch in diameter and look like mini cabbages. They first appeared in northern Europe during the 5th century, but were eventually cultivated near Brussel, Belgium, hence the name. The peak season is from June until January, but you can almost always find them in the freezer section. Brussel sprouts will last about a month when frozen before they begin to wilt, and they’ll last 1-2 weeks in the refrigerator. Brussel sprouts are a great source of vitamin K, vitamin B, folate and vitamin B6. They’re also high in fiber. Fiber helps you to keep full longer and has been shown to have cholesterol reducing properties. Roasted Brussel Sprouts and Sweet Potatoes is a beautiful, easy and impressive side dish. It’s simple to put together but the rich and delicious flavors are anything but simple. A superior roasted vegetable recipe that will have your tastebuds singing with joy. 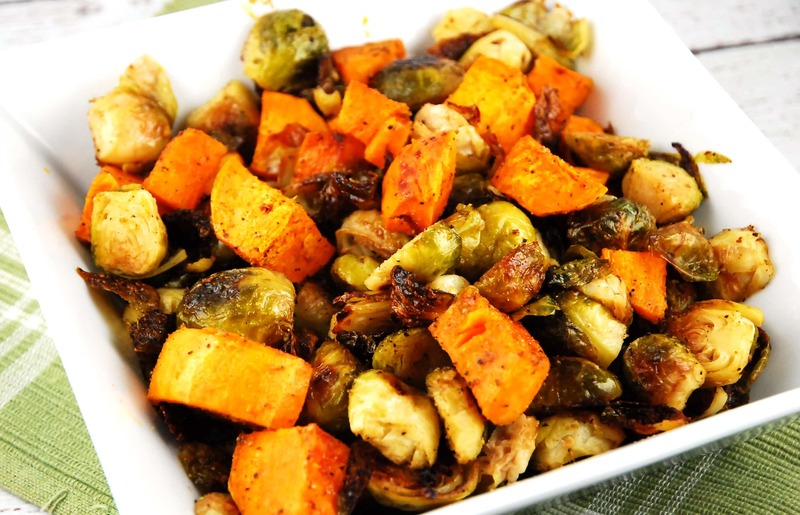 The divine flavor combination of the sweet potatoes with the earthy brussel sprouts is a most delicious way to get those healthy vegetable servings in. Preheat oven to 400, and line a rimmed baking sheet with parchment paper. In a large bowl, toss the brussel sprouts and potatoes with the olive oil, garlic, cumin, and salt and pepper. Pour the vegetables onto the baking sheet and roast for about 40-45 minutes, or until browned. Place the hot vegetables in a large bowl, and toss with the red wine vinegar. Serve hot.